A sediment is a mass of material that originates from the weathering and or erosion of the earth’s surface substances which, in the majority of cases, have been transported and deposited elsewhere. Naturally, the transporting agents are the same as those that cause the erosion, that is, wind, ice and water. These different transporting agents, acting within various environments, will give the sediments distinctive characteristics, termed facies. As such, the interpretation of a sedimentary succession consists on the identification of their respective depositional environments and the history of the various sedimentation stages. It is therefore useful to group the different parts of a stratigraphic column according to the different transporting agents and, or depositional environments under which they were deposited. The larger the differences between the depositional conditions across a sedimentary pile, the more likely it will be that a non-depositional cycle separates them. Hence these breaks are ideal markers for stratigraphic groupings. These surfaces are termed unconformities and the American Geological Institute Glossary defines them as the break in the geological record where a rock unit is overlain by another that is not next in the stratigraphic sequence. That is, the surface of that break represents an interruption of the cycle of sedimentation caused by a cycle of no sedimentation and, or weathering as well as erosion. When the surface of the disturbance separates essentially parallel strata, we are dealing with a disconformity. That is, we are dealing with a short geological time break, since there was not sufficient time for the older rocks to be tectonically disturbed. I think the terms disconformity and diastem are equivalent because there is little difference between having had a short period of erosion (disconformity) or a non depositional period (diastem). This type of sedimentation break is well exemplified in figure 81 where not only is the surface separating the two horizons sharp, but also the characteristics of the sediments on either side are considerably different, with the lower horizon showing a high level of sorting and the one above, the opposite. There is therefore a definite change in sedimentation characteristics across that plane, indicative of a stage of erosion, but the time break was not long enough to allow additional alterations. The other example shown in figure 31B, although referring to a volcanic sequence, is just as good since the principals are exactly the same. In this case the lowermost lava outflow has weathered to a paleosol. That is, the lowermost lava band was exposed at the surface during a long enough period to be weathered completely into a soil. The layer above consists of an accumulation of partially weathered lose lava fragments, either transported from nearby, or eroded “in situ”. Covering it all there is a younger fresh lava outpour. Hence, the boulder horizon is the disconformity plane distinctly indicating a period of weathering and erosion. 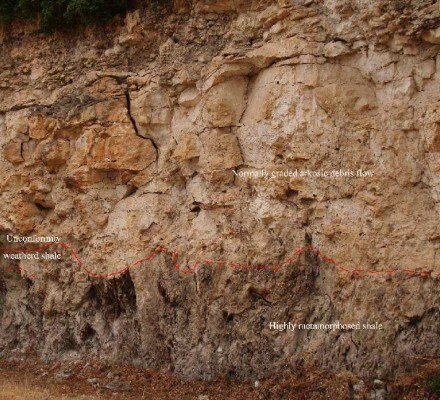 When the unconformity surface separates an older tilted or folded strata from a younger undisturbed, or less disturbed strata, we have an angular unconformity (fig. 82). Note how uneven the erosion surface (unconformity) plane is, in this example. 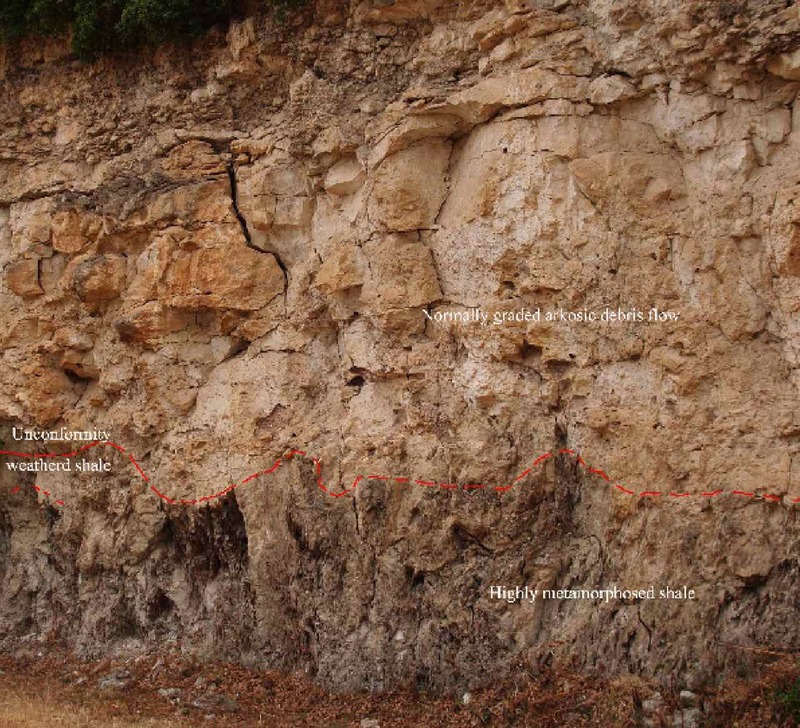 The arkose above the unconformity belongs to the recent Tagus and Sado estuary sedimentary column and the metamorphosed contorted shales below belong to the Lower Alentejo Flysch Group, of Devonian age. Thus, although irregular, this plane demarcates a very long cycle of erosion and, these irregularities can be much more deeply incised, when there is intense ravinement. Figure 82 – Irregular unconformity plane separating highly contorted flysch sediments of Devonian age below, from a horizontally laying arkosic sandstone of the Tagus-Sado estuary (view approximately 3 m high) (Vale do Gaio, Portugal). Now, going away from the mountainous terrane towards areas with a more even topography, better defined, smoother plane surfaces, start appearing, cutting at a distinct angle across the older sedimentary succession. Figure 83 is a very good example of an inter-regional unconformity plane. 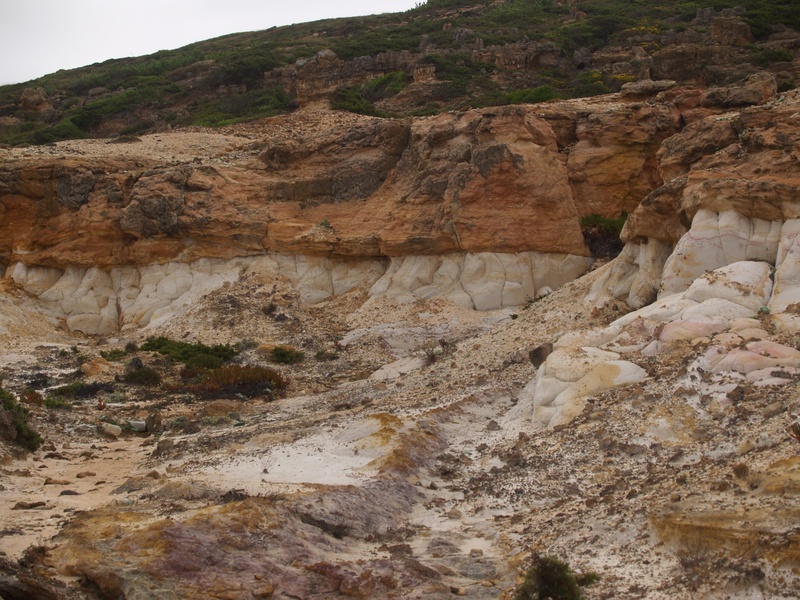 It separates the Witwatersrand sediments from the thick pile of Ventresdorp Lavas. Notice also, at the right hand side of the photo, how the conglomerate becomes thicker as it steps from a hard quartzite onto a soft shale surface. In other words, it is the same principle as in Peneplanation (item 4.4.2.2), but at a much smaller scale. 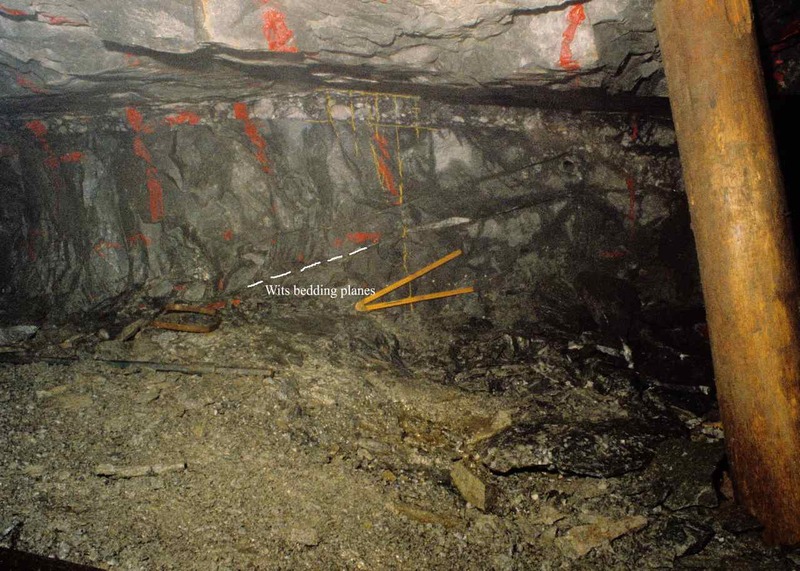 Figure 83 – Typical case of an angular unconformity (Ventersdorp Contact Reef, East Driefontein Gold Mine, Carletonville, S. Africa). Naturally there are all sorts of variations on the theme. In the example shown in figure 84, due to the limited range of the photograph, there is no apparent angular difference between the sediments bellow and above the conglomerate, but there is no doubt that an unconformity is present, because additionally to the angular difference between the strikes and dips of the sediments on either side of the unconformity, we have a marked difference in the characteristics of the quartzites. 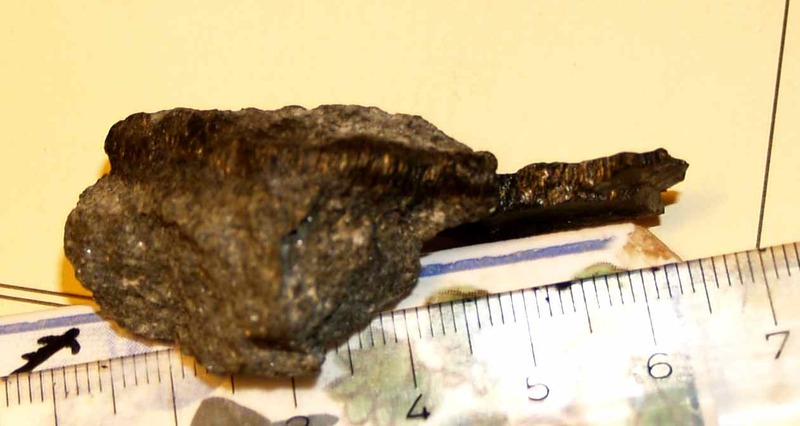 Also, there are occasional scattered, well rounded pebbles and, most important, the Carbon Leader, although very seldom thick, is one of the richest gold bearing horizons within the Witwatersrand Supper Group. That is, there was sufficient erosional/satatic time for the gold to concentrate. 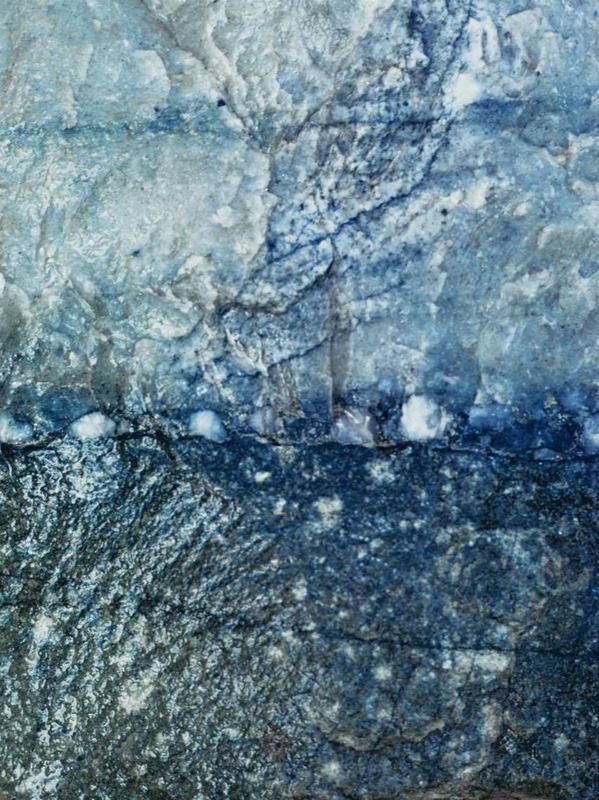 Figure 84 – Very even unconformity plane with disseminated scattered pebbles – notice distinct difference between the quartzites on either side (the conglomerate thickness is 3 cm) (Carbon Leader. East Driefontein Mine, Carletonville S. Africa). Finally, to my knowledge unique in the Carbon Leader, locally there are areas where the unconformity is defined by a single algal mat, seldom exceeding 3 mm in thickness which, in the majority of cases, contains abundant interstitial gold (fig. 85). Once more, there must have been a sufficiently long erosional and or non-sedimentation period for algae to grow and capture gold suspended in the sea water. 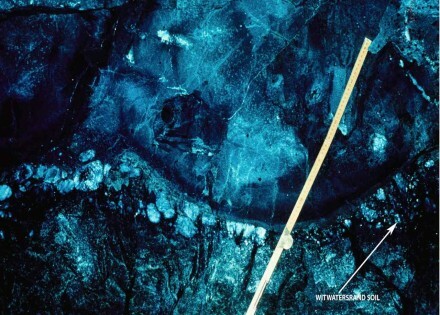 Figure 85 – Algal mat with abundant interstitial gold (Carbon Leader. East Driefontein Mine, Carletonville S. Africa). Returning to figure 82, notice the layer of weathered flysch defining the bottom contact of the unconformity. In a present day surface occurrence, it is very frequent to encounter in situ weathered rock, that is soil, overlain by another layer of soil that was transported. Since these two adjoining soils may have very different textures and structural strengths, these must be clearly determined by the civil engineers, when evaluating the strength of the foundations needed for large constructions. 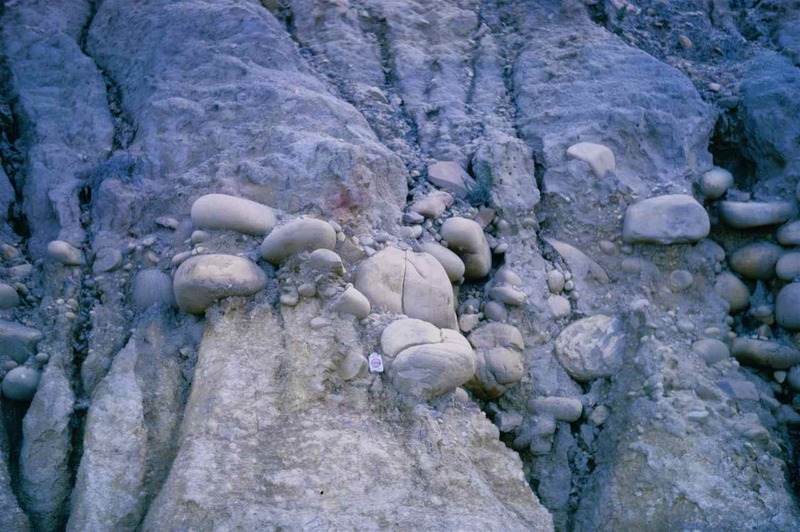 Fortunately, to assist in the identification of these distinctly different elements, there is often an erosional period sufficiently long to allow the accumulation of a layer of larger clasts while the lighter material was washed away (fig. 86). In other words, we have the same principle as the desert pebble screen (fig. 49), but this time with water. This coarse clast layer separating in situ, from transported soil is termed the pebble marker. Figure 86 – Poorly sorted beach horizon conglomerate separating weathered rock (in situ soil), below, from transported soil above – pebble marker (Simonstown, South Africa). Another unique example of the weathering of outcropping rocks during the weathering/erosion cycle, is shown in figure 87, where an erosional period sufficiently long to allow the formation of a conglomerate, was “sealed” by an outpour of submarine lava with its pillows, which fell on top of an unconsolidated conglomerate, squeezing it between the pillows, not only the conglomerate pebbles, but also the underlying soil, soft due to the weathering. Figure 87 – Lava pillows squashing Ventersdorp Contact Reef (VCR) and the underlying paleosol (East Driefontein Gold Mine S. Africa). Present day examples of angular unconformities are the occurrence of shore line gravel beds (fig. 88), indicating a marine transgressive lag. The larger the boulders, the higher the energy of the erosional agent. In Southern Angola I saw some coastal conglomerates with no noticeable matrix and with boulders much larger than the ones shown in figure 88, but I did not have the opportunity of photographing them. 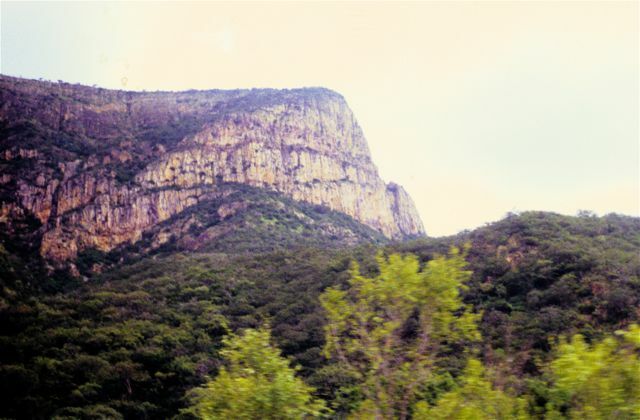 Perhaps these southern Angolan coastal conglomerates are equivalent to those of the Cape Peninsula (fig. 86) and I think they are related to the isostatic uplift of the Southern African continental plate. The clast dimensions are identical, but the Angolan conglomerates are much more robust. 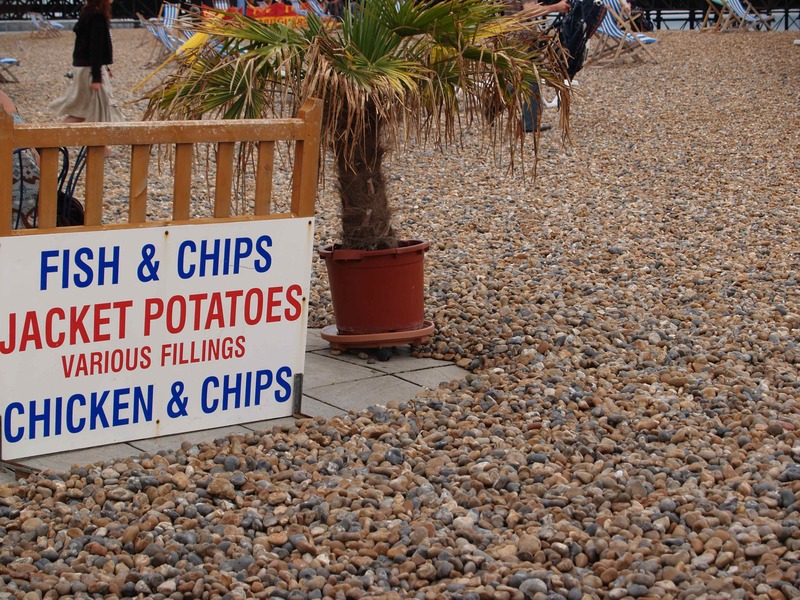 Figure 88 – Pebble beach (Brighton, England). A plane separating a strongly eroded plutonic, or a massive metamorphic body below, from a sedimentary body above, is termed a non conformity. I have seen very few of these and none could really be photographed. Even this one in Angola is not that clear, but for completeness sake and the fact that it represents a huge time gap, I am including it (fig. 88B). The very thick column of Karroo age sandstone, Triassic, is overlying basement granite of Precambrian age and the wavy contact is reasonably well noticeable. Thus, this is indeed an inter-regional unconformity in a grand scale. This entry was posted in Geology, Unconformity. Bookmark the permalink.